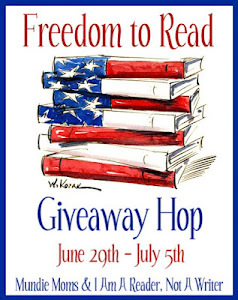 The The Freedom to Read Giveaway Hop is hosted by I Am a Reader, Not a Writer and Mundie's Moms. It will run from June 29 - July 5. I'm as lazy as ever. Or let's just call it traditional. Or perhaps...adverse to change. Any who, I'm giving a way a book of one lucky winner's choice for $10 or less. You can participate if the Book Depository ships to your mailbox. Good luck and I hope everyone gets some great reading in! Read a little extra for me! This contest will end on July 5 at 11:59pm central time. I will announce a winner a few days after. Good Luck! Thanks for the giveaway! I would probably choose Endlessly by Kiersten White because it's coming out soon and I definitely want to complete my trilogy set. To be honest I have no clue! Theres so many amazing books to choose from! I would choose The Hourglass Door by Lisa Mangum. Thanks for the chance to win! Uhh...lets see. Maybe a preorder of Blood Fever by Veronica Wolff! Although I may change that! Thanks for the generous international giveaway. Yay! Eeek! Either Summer and the City or Sweet Evil! Thanks for the giveaway! I would get The Blue Girl by Charles de Lint. Maybe a pre-order of Breathe by Sarh Crossan. My So Called Afterlife or I don't know. There's so many I am not really that sure! Thanks for the giveaway! I would choose Black Heart by Holly Black. I would pick Under The Never by Veronica Rossi. Thank you for the giveaway. Night Play by Sherrilyn Kenyon. I would get The Cursed by L.A. Banks it is the one book that I am missing to complete the series and my local library doesn't have it. I'd choose City of Ashes :D thanks for the giveaway! I´d choose Heist Society by Ally Carter. Thank you for the giveaway. I would choose obsidian Thanks so much for the giveaway!!! Not sure...maybe volume 21 of Naoki Urasawa's 20TH CENTURY BOYS manga series. Grave Mercy! I think. Or a pre-order of Throne of Glass. Thank you for the giveaway, you're awesome! Tiger's Curse by Colleen Houck! I would like to win Dash & Lily's Book of Dares by Rachel Cohn and David Levithan. Thanks for the giveaway! The graphic novel of Uglies by Scott Westerfeld. I think I would pre order Throne of Glass, can't wait to read that book! I would love to preorder the last hush hush but if it can't be preorder I would get obsidian! Iron King by Julie Kagawa. I would choose Pure by Armentrout! Thanks for the giveaway!! I honestly don't know yet. I don't want to decide on anything yet because i didn't want to get my hopes up if I didn't win. Possibly Shadow and Bone by Leigh Bardugo! I would get Samurai Game by Christine Feehan. maybe insurgent by Veronica Roth? If I don't splurge and buy it, the next book in the Maze Runner series- book one was amazing! I am thinking about Magic Burns by Ilona Andrews. I'd probably choose Delirium by Lauren Oliver. Not sure I have a few on my list. Maybe Cinder. Awesome giveaway - I would pick Gone Girl. I would choose Storm by Brigid Kemmerer. :) Thank you for the giveaway! Such a hard choice. I can't decide (which is why I spend hours in a book store). Maybe Wicked Ties? I have no idea which book I'd choose! My wishlist is huge!! I think I might choose Storm by Brigid Kemmerer. Thanks for offering! I want The Goblin King by Shona Husk. Clockwork Prince ? I'm not really sure, there are too many amazing books! Thanks for this amazing giveaway! I would love to win and get Shades of Grey! i would choose a CassandraClare book......thanx for the giveaway!!! I'd take Rules of Attraction by Simone Elkeles. Thanks for the giveaway! I think I would choose Blood Song by Cat Adams. I would choose 21st Century Courtesan by Eden Bradley. Hmm mayb the girl in the steel corset?! So many titles on my TBR list. Would be hard to decide... maybe Shatter Me. Tiger Lily or maybe The Night Circus. I think I'll go with Serial Hotties. It one both my daughter and I can enjoy. Once Burned by Jeaniene Frost! Maybe Timepiece, I'm not positive lol. I would choose Sweet Evil by Wendy Higgins! Thanks! I'd choose "Room" by Emma Donaghue. I'd choose probably Half-Blood by Jennifer L. Armentrout. Maybe Obsidian by Jennifer L. Armentrout. Maybe Obsidian..I'm not sure yet.. I'd choose Until I die by Amy Plum :) Thanks! not sure, too many to choose from.... Starcrossed by Josephine Angelini maybe? thanks for the giveaway! Thanks for this giveaway ! I would maybe choose The Mysterious Benedict Society ! I would choose Vanquished by Nancy Holder. Thanks for the chance at this great giveaway! I would pobably pick Drive By by Jim Carrington. hmmm not sure. maybe bloodlines? Hmmm. I am not too sure yet. Maybe Obsidian! I'd choose The Scarlet Letter by Nathaniel Hawthorne or Struck by Jennifer Bosworth. I would choose Ascend by Amanda Hocking. Thanks for the giveaway! I'd like to finally get my hands on a copy of Second Chance Summer. Thanks for the giveaway! I would chose Revived by Cat Patrick. The Goddess Test by Aimee Carter! maybe iam choose : all kerrelyn sparks or donna grant books..
One of the books on my wish list is "Shotgun Sorceress" by Lucy A. Snyder. Probably Gunmetal Magic by Ilona Andrews. Maybe Insurgent by Veronica Roth or Once Burned by Jeaniene Frost... or maybe Shadow of night by Deborah Harkness. Thanks for the great giveaway! I would choose Grave Mercy or A Clash of kings! I think I'd choose Insurgent! thanks for making htis interantional!! Thanks for the chance! Have a super nice 4th of July. Would love to have Insurgent by Veronica Roth. I think I would choose Cold Fury, thanks for the giveaway! I would like Before I Wake by Rachel Vincent! Thank you for the great giveaway! Obsidian by Jennifer L. Armentrout or Half-Blood. Anyways, thanks for the giveaway!